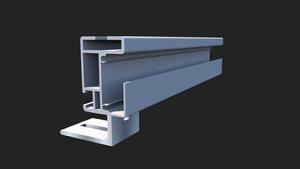 Our Lite Duty Rail incorporates an innovative wire management channel built in the rail. Also the new L Foot has the ability to adjust up to 1.25" in height for uneven and bowed rafters. Rail strength is the strongest in its class rated at 80" max spans for 120 mph wind zones and 48" spans for 80lb snow loads. Priced competitively to beat all others in its class, the new Lite Duty Rail Pitch Roof System is the best solution for all your pitch roof mounting installations.